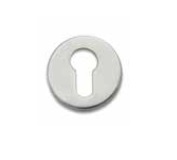 Euro profile cylinder escutcheon to match lever handles 4703.20.140, 4706, 4701.22.140, 4707 and 4708. Concealed fixings with snap on cover. Supplied as pairs as standard.